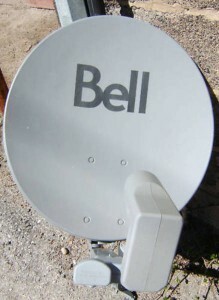 The 21" x 23" satellite dish used by Bell TV allows reception from up to two different DBS satellites spaced 9 degrees apart from each other. With the included LNBF, you will be able to receive one of the 2 Bell TV satellites of your choice. (i.e. 91W for SD or 82W for HD or internationals). You may easily upgrade this dish with an optional second LNBF and a SW-21 switch (not included) in order to receive both Bell TV satellites at the same time in order to get all available channels.